Whether a catering business is a restaurant or outside catering it needs to show a profit. When deciding on menu choices and prices the business owner has to be able to cost accordingly in order to survive. Menu contents can vary widely depending on the type of catering establishment owned. 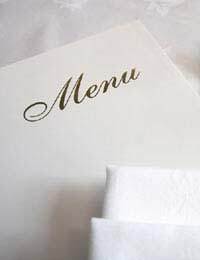 The one thing that is constant is the need for customers to buy from the menu and for you as the business owner to make a profit. Outside caterers, particularly those who offer wedding and corporate catering will have to be particularly competitive and still make a reasonable profit as their services are pre booked and there will not be a chance to increase sales at the event. The menu in a restaurant will always be the lure to attract new custom. By advertising special prices for a set or short menu or perhaps happy hour offers the customers with a tight budget will step over the threshold. Competition from nearby businesses could also affect prices but being the cheapest does not always make a restaurant the best. Reducing the size of a menu will mean less wastage as will using the same ingredients for several menu items. Some restaurants and cafes have a vast menu which means storing many ingredients that may well go past their use by date and have to be destroyed. Purchasing large amounts of produce will also eat into the cash flow and could cause problems when paying suppliers. Keeping the menu short and changing it often plus buying produce in small amounts will mean the caterer is in control of his finances. Having a board displayed where that day’s specials can be shown and having waiting staff point out the specials will encourage clients to buy so there is less wastage. Beverages and alcohol are a sure fire way to increase profits when offering a set menu. Making the wine list interesting by supporting local vineyards will not only help local businesses but mean the restaurant or cafe owner can order in smaller quantities as delivery time is shorter. Special tasting evening for regular customers is another way to encourage interest in a business. Selling specialist teas and coffees will add to profits especially as many clients are unable to drink and then drive. Seasonal vegetables from local farms and growers can be purchased daily or as required. Make a point of getting to know local growers so you are first in line as produce comes into season. Fresh and organic meat is another enticement when making a menu look attractive to the guests. Show that products are sourced locally and that they are fresh. Make a point of sitting down and calculating costs for each menu. A simple computer spreadsheet can be prepared that shows each menu item and the profit margin. By adding the total of all recipe items on the menu and then dividing it by the number of portions it will give the gross profit. Wastage, staff costs and other overheads will need to come from the profit. An accountant or bookkeeper will advise on the gross profit needed in order to pay the overheads of the catering business leaving the owner or chef to shop within the guidelines and make a profit.